Posted March 23rd, 2018 at 12:23 am | Log in to reply. I’ve taken on the task of making doenjang for my family and I. I am a couple of days from putting my meju in the box, and one of my blocks fell and broke on the ground. Everything smells good, there are little white dots growing , but there is also some darker colored gray fuzzy mold inside. I would like your opinion of this is some good mold or possibly the bad stuff. Thank you for everything you do, you are a true beacon of light! Posted March 23rd, 2018 at 12:25 am | Log in to reply. Posted April 3rd, 2018 at 8:34 am | Log in to reply. I love your meju, it looks great. Darker fungus is ok, you will wash most of it later anyway. 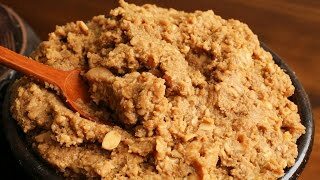 Go ahead and make doenjang, good luck! Posted July 23rd, 2018 at 4:50 pm | Log in to reply. I want to show off my updated project to you! It has about 4 weeks left in the pot. It’s so exciting to reach each step of the process. I like the way it smells, the smoke and all the flavors. Posted August 1st, 2018 at 1:29 pm | Log in to reply. 1 week later and hello! I think I’m going to separate the gangjang and doenjang today or tomorrow. It’s only been about 5 weeks but I’m surprised how much fungi my small batch produced. I used 40% of your recipe. Thank you for updating! Your white fungi flowers look gorgeous! Posted February 16th, 2018 at 7:47 pm | Log in to reply. Thank you so much for this recipe and process. I was so excited I started making the meju right away. I am a bit worried I didn’t get the beans ground fine enough – the blocks are just starting to dry but are not as smooth looking as yours. Do you think it will still hold together to hang? I think I will tie it especially well or maybe dry it inside some mesh bags just to make sure. What do you think? Again thank you for leading us through this amazing process. I can hardly wait to try it! Posted February 17th, 2018 at 2:20 pm | Log in to reply. Without seeing it, I’m not sure it will hold together or not, but the beans will be fermented nicely. Later after all fermentation is done, pound the beans again to make them smooth. Good luck! Posted February 21st, 2018 at 12:49 am | Log in to reply. They held together! Now have them hanging in a closet so they don’t get jostled. Looks likempossibly some mold on one of them but will watch it to see what happens. Posted October 24th, 2017 at 1:47 pm | Log in to reply. I just tasted my ten month old doenjang. Compared to the store bought stuff it is saltier, sharper, more tangy, more complex, with every strand of flavor heightened and intensified. It makes the store bought stuff seem bland and dull. I expect that as it ages longer it will get more mellow and more sweetness will develop. The aftertaste is lingering and wonderful. I can’t wait to make something in which doenjang is the star ingredient! Posted October 24th, 2017 at 11:01 pm | Log in to reply. I’m very happy to hear that your doenjang project turned out good! I agree with your description about the taste of well made homemade doenjang. When I make doenjang jjigae or ssamjang, I mix my homemade doenjang and store bought doenjang to save my homemade and to cut it because it’s kind of salty. Posted September 17th, 2017 at 2:23 pm | Log in to reply. I need your help, a month ago I put the meju in salt water and these days grew a white layer above the meju and charcoal. Is this bad? or do I have to start over? I hope you are well, greetings from Mexico. Posted April 3rd, 2018 at 8:36 am | Log in to reply. Sorry, I’m just seeing this photo right now. It looks great! I’m sure your ganjang and doenjang turned out delicious! Posted July 20th, 2017 at 1:16 pm | Log in to reply. Hello dear Maangchi, I write from Mexico to join you for sharing your recipes with people who love the culture and gastronomy of Korea. I started this project in a little 20 days, and I’m worried about my meju, every day I take it in the sun because I do not have an electric blanket, and at night I put it behind the refrigerator, but this morning turning the meju I realized that Have mushrooms, do not know if they are good or bad, breaking a piece has a strong smell and more fungi of color between green and black. As you see, is it a problem? is on a good path? Or do I have to start over? Thanks for all the wonderful videos, I will continue to support you in the distance, a strong hug, blessings always !!! Posted July 20th, 2017 at 1:46 pm | Log in to reply. Your meju looks awesome! Before soaking them in salty water, clean the fungi. Use a soft brush and wash them. I’m sure your ganjang and doenjang will turn out very delicious! Let me know. Posted May 31st, 2017 at 1:00 pm | Log in to reply. 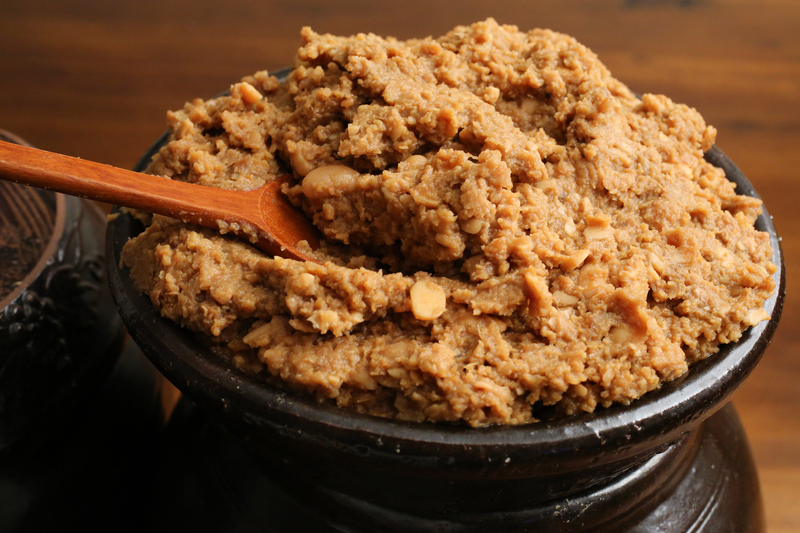 Maangchi – I separated out my doenjang from guk ganjang about two months ago. My doenjang looks like there’s fungus growing on the surface of it. Is this ok? Posted May 29th, 2017 at 4:54 pm | Log in to reply. Posted May 29th, 2017 at 7:10 pm | Log in to reply. Thank you for sharing your amazing story with me and my other readers! “I am proud to say that my marriage survived the hanging and storing of my meju block.” You must have enjoyed the journey from the beginning to now! Congratulations! 5 to 6 months later, you will make the most delicious Korean doenjang soup or stew! Posted May 16th, 2017 at 3:38 pm | Log in to reply. Hello! First I love all your recipes, I am slowly cooking every one from your book! My blocks look ok and I was about to move to the step of putting the blocks in salt water, and as i was washing them I though I need to break them and check the insides because how can the inside get cleaned? I think one block is ok and the other has black mold? I will move forward with just the non black block. The other one looks scary! Posted May 16th, 2017 at 4:24 pm | Log in to reply. Black fungi is not a good sign because it’s made from bad and harmful bacteria. It should be brown, orange, white, or a little bit green. Remove the black part with a knife and wash it with brush nicely and dry it sunny day. After that make doenjang with it. Posted March 23rd, 2017 at 7:31 am | Log in to reply. first of all thank you so much for your amazing recipe(s)! As soon as I watched it, I instantly had to try it, though I already expected it to be a tough task. It’s been about 2 weeks now that I hung up my two meju blocks (each about 300g) and they pretty much look exactly like yours (which makes me kind of happy). The only thing is, they smell EXTREMELY. Since I never made this before I have no idea what they’re supposed to smell like, but my kitchen has meanwhile turned into a cowshed and I seriously wonder if that’s what you mean by “pungent”? It doesn’t bother me much but I’m really afraid something went wrong and my meju turned out bad…The smell makes me keep the window open most of the time which also results in a temperature of about 15 degrees (celsius) in my kitchen – is that too cold? Or do you even think I might hang them outside for drying though it’s only about 10 degrees (celsius)? I’m also afraid to kinda “overdry” them, so do you think 2-3 weeks of drying and 1 week of fermentation inside the cardboardbox will be enough for my small meju blocks? There’s also hardly any mold (neither black nor white nor green) on my meju blocks yet – is that fine? Will the mold grow during the time inside the cardboard bow? I’m so sorry for my novel of questions but I enjoy all of your recipes so much and I really try to make everything come out as perfect as possible. So if you’d find the time to reply shortly and give me some advice I’d be incredibly happy! You’re my kitchen idol. Thanks for everything and all the best! Posted March 23rd, 2017 at 4:57 pm | Log in to reply. It sounds like your meju is fermenting well! I totally understand how nervous you are because you are making doenjang for the first time in your life. Yes, it smells. They are supposed to give off a pungent smell. I don’t want to say it smells bad because they will turn into delicious and precious doenjang soon. If you succeed in making delicious homemade doenjang once, you will love the smell that comes from them. Hanging meju at 10 to 15 degrees (celsius) will be ok. Don’t worry much about fungi as long as the meju have a strong smell. Only if the meju has a sour smell and slimy stuff inside, it means it’s rotten and you have to throw them away. “Will the mold grow during the time inside the cardboard box?” yes, I think so. Be sure to set them out where flies are not around though. Posted February 18th, 2017 at 3:25 pm | Log in to reply. But the bean blocks are still hard. When I try to break them, I saw some black and white inside the blocks. Is it normal? Should I continue the steps or throw them away? Pls give me your advise! Thank you! Posted March 1st, 2017 at 9:23 am | Log in to reply. Yes, I love the color of the fungi in your meju. Wash the fungi with a brush and dry it out. Posted March 8th, 2017 at 7:41 pm | Log in to reply. I already processed the step: separate the doenjang from the soy sauce. in your diary, it should be :June 11 — Separated doenjang and guk-ganjang. I saw your video you mentioned no water in this steps. are you sure i can wash the fungi? Posted February 9th, 2017 at 11:56 am | Log in to reply. Posted February 12th, 2017 at 2:35 am | Log in to reply. Posted February 13th, 2017 at 9:03 am | Log in to reply. Oh no, the third day of fermentation, i observed some black mold on the block, white one more than black one but i am too worried so i cut off the black mold and hope that the white one can outgrow black mold. Posted February 13th, 2017 at 9:10 am | Log in to reply. Posted February 13th, 2017 at 10:47 am | Log in to reply. You did a great job cutting off the black mold! Good lucK! As long as you give them good care like that, I’m sure the meju blocks will turn out good! When I ferment my meju, I’m always excited to see them and even the stinky smell makes me happy. “uh? where is this smell coming from?” Then I realize it’s coming from my meju hung on the wall, then I smile. It’s so fun doing a long time project. Posted January 30th, 2017 at 8:13 am | Log in to reply. Posted December 10th, 2016 at 2:55 am | Log in to reply. I’ve been making doenjang and already soaked my doenjang in brine inside an earthernware pot. After several days, I found a growing white fungus on top of the brine, I took a picture of it. Is it okay or should I change the brine? Usually I put it outside and sunbathe it on sunny days, but I never let water goes inside. Posted December 2nd, 2016 at 2:58 am | Log in to reply. I would like to have your thinking about these one, i am not really sure about black/dark blue fungus, my first try.. thanks a loooooot for all your yummy videos! hug from France see youuuu! Posted November 19th, 2016 at 5:39 pm | Log in to reply. Maangchi, you are so awesome. I was one of the people begging you to post this, probably 10 years back! I just happened upon it here today. Thank you so much, and thanks also for helping people through the process. Time for me to get on it! I will definitely be buying your book. The video was watched 1,777,286 times on YouTube & has 26,227 likes!